Would deeply appreciate some critiques! 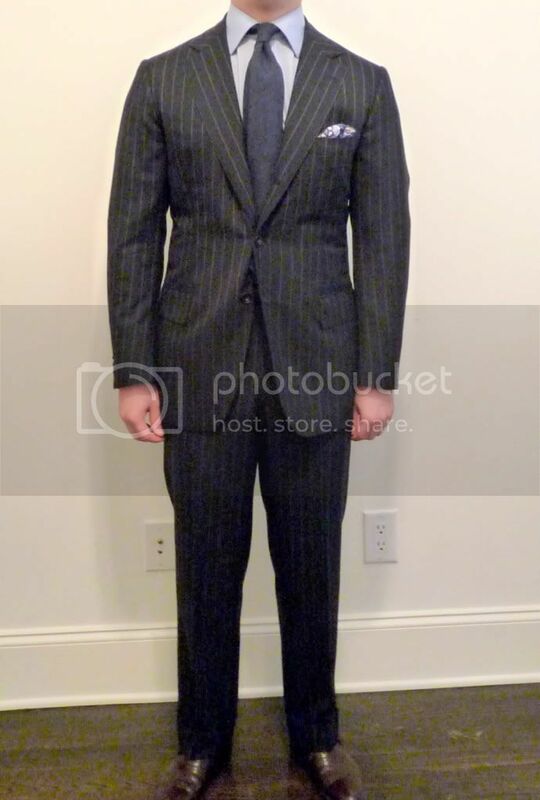 Just had this suit made in 20/21 oz Huddersfield/Dugdale worsted, inspired by what I've read around here. Sorry for the poor quality pics, I'll try to do better later. 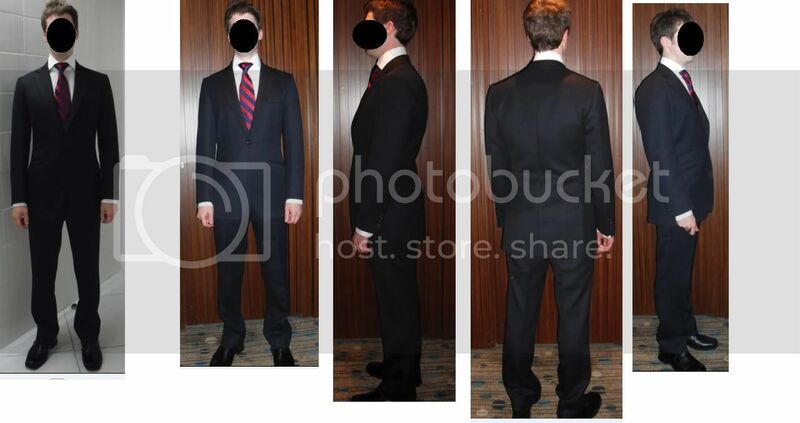 The suit is nice but not what I was looking for 100%, as in the model pics at the bottom. I was trying to get a very fitted, military/hard cut type cut. The end result is something that could be trimmed up closer to my body a bit correct? Where exactly could it be brought in? The trousers seem to break excessively towards the bottom, could anyone but a master tailor fix such an issue, and how? million thanks. What I noticed right away is the horizontal pull or drag lines across the back waist- (your back is not the easiest to fit) it looks like too much was taken in on the sides to get it to fit into the small of your back- it might have been better to be shaped more through the CB seam. The other pull is visible in profile and there are tension lines from mid chest to the waist area of the side back seam on your right side- this to me looks like either over suppression again or a slight balance issue, or some more correction is needed for your low shoulder. The armhole depth doesn't look too low, but there is a delicate balance in getting a close fit through the body and a high armhole. As you get closer and closer to the body, the width across back has to come closer to the body's measurement in order to get a clean line through the back armhole to the shoulder. Trousers- they are collapsing through the back leg under the seat from what I can see in the photos, that is a pattern issue, slope/angle/shaping of the CB seam, and that causes them to hit the back of your foot. They also look a bit too long and perhaps the hem could be shorter in the front if it isn't already. The problem is made worse by the fact that the bottom width is fashionably narrow and straight and makes no allowance for the bulk of the shoe, so the fabric has no where to go but where you see it going. When dealing with very narrow trousers, it can help to flare, or let out the inseam and outseam ever so slightly to allow a bit of extra circumference at the hem, then the trouser hem can be shaped a bit and sits better over the shoe. Old fashioned technique. Otherwise the hems need to be quite a bit shorter which is not what our modern eye is used to seeing. Excessive waist suppression needs more iron work in the back. And this back has not seen any iron work in the waist. It is hard to do now unless you open the side seams. Who ever made the suit has good talent and is self educated. The point is that it is hard to teach yourself iron work autodidactic, you need to see it in order to understand it. You are standing erect, there is little length missing. It is not enough to stitch a pattern together you also need to know what you stitch together and why are the parts shaped that way and here starts the difficulty what you cannot learn from books so easy. The more accurate the pattern is the less iron work it needs. But then it becomes art. The armhole is not too bad, you can leave that alone. Why are the trousers too long? Maybe the tailor gave up on you and run away. Even a blind sees that the trousers are too long. Edited by Der Zuschneider, 05 August 2010 - 02:59 PM. I am also curious as to whether the lounge coat is cut with a side body ie is the underarm seam extended all the way to the bottom of the skirt? Not sure about the back being too long or just too tapered, I guess a combination of both. What the coat lacks is that typical full chest of that British Huntsman cut and that more structured shoulder, I think the cut of your coat is slightly different to that. The coat is sitting on your stomach, hence the drags, unbutton it and you'll see by how much it is too tight. This tailor (from Naples) overdid the waist suppression, too. Ideally there should not be much of a difference, or as Nishijin said it elsewhere on the forum: The button is a safety! 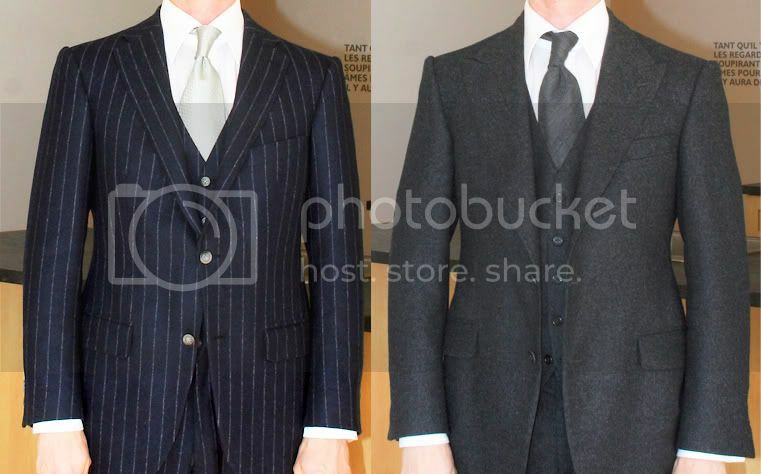 Did you ask your tailor if he is familiar with making a Huntsman style coat? Because if he/ she is not, the result will look a bit different. The trousers need less length and a bit of shaping to make room for your calves, plus some minor alterations in the seat area. There is not enough calves in this world for those 'Saebelbeine'. The waist suppression in the back is so much that it drags the coat tight on the belly that’s way also the 'Schraegzuege'. The Naples coat is to narrow even in the chest. Yes, this is definitely a factor. 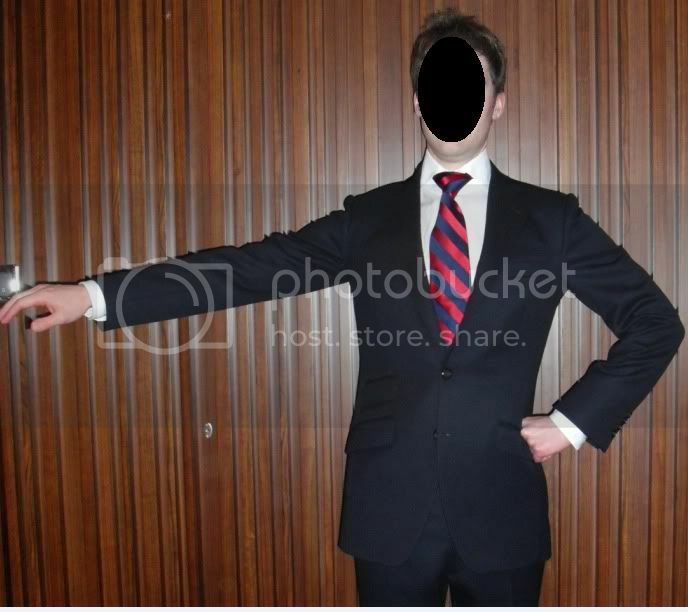 I agree that the tailor failed to fully correct for an over erect stance. The excess back balance appears as messy drags over the back at waist level. Sway backs are notoriously difficult to fit. The one sway back I fitted, I honestly guessed and luckily for me I hit the mark. I could never in a thousand years repeat it, as I don't know what I did. I think, with my haevy 15 pound iron on the feltmat I would be able to iron dress those folds in the back short. With modern sucking steam table there is no chance to manage that. Those modern iron stations are made for dress makers and desingers not for traditional Herrenschneider of old schools. Edited by Der Zuschneider, 06 August 2010 - 02:10 PM. I like your closing Lewis. One of the problems here is the button stance is too high in comparison to the back waist level. Another problem is you may have gained weight between the fittings. I wouldn't say that you are a sway back as some suggest you might be. There seems to be to much round in the back. The back shoulder slope seems to be amiss. 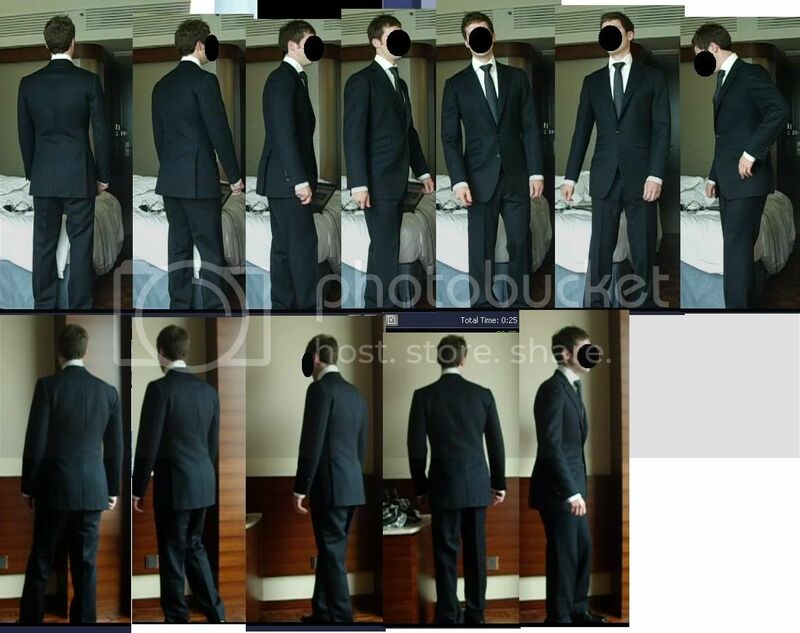 When looking at the picture below it looks like the button stance is below the waist, which looks and fits much better. I still would like to see that coat unbuttoned. I'm sure it will be pulled towards the back quite a lot. The back rests on the hips as well. I should also like to say thank you to Svenn for having the courage to post those images on a forum where people are so critical. Apologies if we seem too critical sometimes but it's such a wonderful opportunity to study and learn. lol, that's depressing that the suit is so ill-fitting that one would think I have gained weight... I've been a thin 160lbs at 5'11'' my whole life... almost no bodyfat. I do have a sway lower back (mild lordosis). Here are some stills from a movie I took, hopefully this will help. I was told by another that the button stance should be lowered as well, after looking at these do you still agree? Also, would it be difficult for an alterationist to lower the button stance on a full-canvassed suit like mine? Oh I'd much rather embarrass myself anonymously than in real life so no worries. 1. open up the space between quarters more like in the Huntsman pics (cut a wider gap below the button). -this is relatively easy for the alterationist right? 2. shorten the length of the jacket by 1 cm. -again, fairly easy? 6. slim up the sleeves? ^what is the risk these things will just create more wrinkles/depressions if the alterationist ends up being not that skilled? This is a major alteration requiring the removal of the sleeves and collar. The moment you do this, the foreparts will open up and you will get the appearance of more cut away at the fronts. The reason for the closed appearance of the front is the short front balance. The same alteration will also lower the button stand of the front as well. I would not increase the cut away at front or shorten the coat until the balance problems are corrected. It is unlikely that an inlay will have been retained here on the final coat. However, given the fact that the shoulders have been cut on the wide side, it would be acceptable to narrow the shoulder during the alteration in the absence of an inlay at the shoulder ends. The trouser hem is easy to fix. The rest of the coat alteration is expensive enough as it is, so I would suggest leaving the width of the sleeves untouched and concentrate on critical balance issues. Until you address the root cause of the problem you can alter it a thousand times and you will still be unhappy with the results. In one of these thousand alterations something bad will happen and the suit will end up in the kill cupboard. It is like performing a thousand operations on a patient that don't treat the root of the problem: it will cause more harm than good. Once the front shoulder has been dropped, the sleeve head will have to be re cut and the collar will become short, which would probably require a complete new collar. This work is complex on a finished garment and needs to be carried out by a very experienced alteration tailor. Edited by jukes, 10 August 2010 - 04:52 PM. In crookening the neck, there is also the danger of making the front shoulder short resulting in a tight armscye. It may be prudent to try to slightly lengthen the front shoulder measure (by 6mm/0.25") to compensate. The other alteration would be to pass down the back. That is, instead of altering the major horizontal balance (which then indirectly lengthens the major vertical balance of the foreparts), you can directly shorten the major vertical balance of the back. You will have to try to maintain the shoulder slope unchanged or else you will see even more of the shirt collar than you do already. This is still a tricky alteration on a finished coat, but perhaps slightly less difficult.